High design in a small package is how we describe this super chic designer small chair having a cherry red shiny laquer Rococo frame and new contemporary graphic upholstery on the seat. 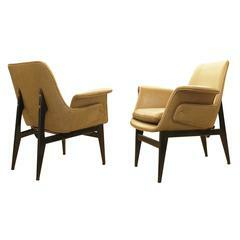 Measures: Seat height 16, seat depth 16.5. 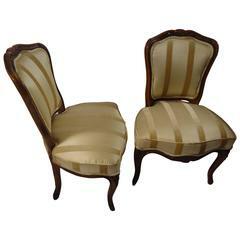 Two movie star gorgeous slipper chairs with carved walnut frames, upholstered in light sand raw silk and velvet striped fabric. Cabriole legs and pretty cartouches at the top. 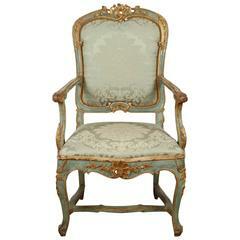 Hand-carved and gilded, Italian, open-arm, Rococo-style armchair with cabriole legs and elegant, serpentine arms. 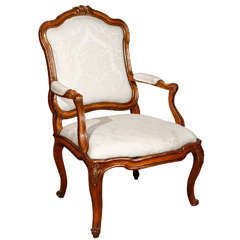 Top rail boasts a foliate relief carving. 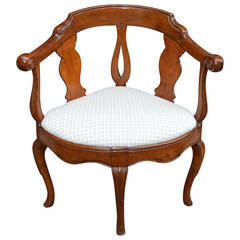 Beautiful Danish fruitwood corner chair upholstered with versatile white fabric with small teal diamond pattern. 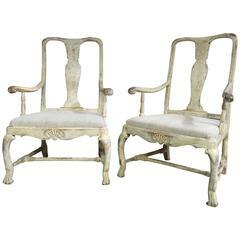 A charming pair of 18th century Swedish painted Rococo chairs retaining the original paint and with a lovely color.